Hello AMO family, greeting from AMO Labs team! The new release of PALLET X marks another great achievement for us in 2019. 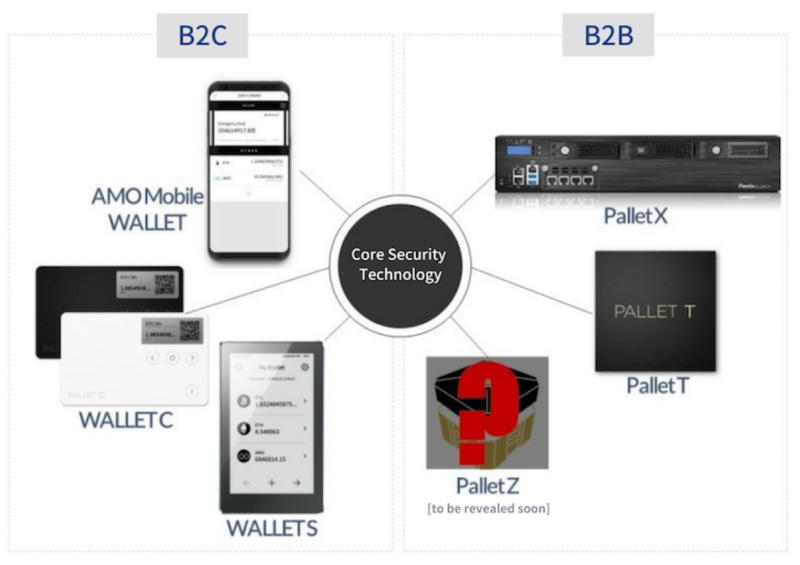 PALLET X is an advanced cryptocurrency wallet based on the core security technology co-developed with Penta Security, the parent company of AMO Labs. The wallet is tailored for digital asset enterprises such as cryptocurrency exchanges, and payment service providers in need of secure, effective, and practical wallet management. PALLET X was successfully released and delivered to local cryptocurrency exchange platforms to be deployed. “Penta Secure Wallet Platform” is the line of crypto wallet products that are optimized for various network environments. The “Penta Secure Wallet Platform” includes a mobile crypto wallet (AMO Mobile WALLET) that can be installed and used by anyone via a smartphone; a personal cold wallet (AMO WALLET S) that cuts off the risk of hacking by staying disconnected from the network; enterprise crypto wallet (PALLET X) with financial security specifications. As you can see in the picture above, there is a wide range of products that span from personal mobile wallets to business-oriented, enterprise-grade wallets. TEE is a technology that manages the separation of key systems and sensitive data from the place where the general call functions are operated. Even if a hacker succeeds in penetrating a device, the technology prevents malicious access into the key management system. So far AMO Mobile Wallet has received great user rating ranging from 4.8 points to 5.0 points in the Google Play Store and Apple App Store. Our next expected major update will be by the end of April 2019. By the end of 2019, the product is expected to include a data collection function, where you will be able to keep your driving data generated from your car in the AMO Wallet. Do not forget to subscribe to our social media channels such as Homepage,Medium, Telegram, Facebook, Twitter, Linkedin, Youtube etc.